Want to be the first to taste the menu at Fishing with Dynamite? 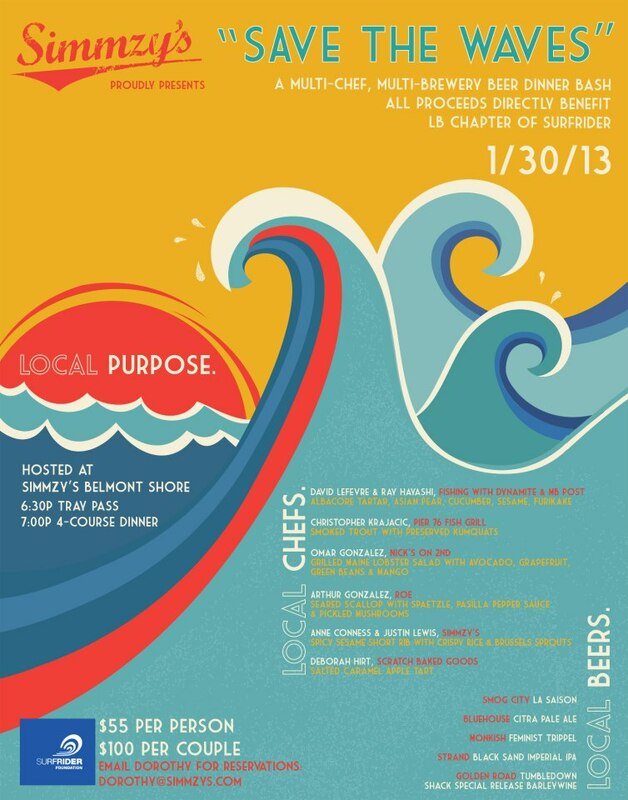 Visit Simmzy’s in Belmont Shore for a benefit dinner taking place on January 30, 2013. Chef LeFevre and Ray Hayashi from Manhattan Beach Post (and the upcoming hot-spot, Fishing with Dynamite), Chris Krajacic from Pier 76 Fish Grill, Omar Gonzalez from Nick’s on 2nd, Arthur Gonzalez from Roe and Roderic Reiswig & Deborah Hirt from Scratch Baked Goods will each prepare a course paired with local beers from Smog City Brewing, El Segundo Brewing, Monkish Brewing, Strand Brewing and Golden Road Brewing. The event costs $55 per person, or $100 per couple. All proceeds benefit the LB Chapter of the Surfrider Foundation. E-mail Dorothy@Simmzys.com for reservations.